Hello and welcome to exampundit. 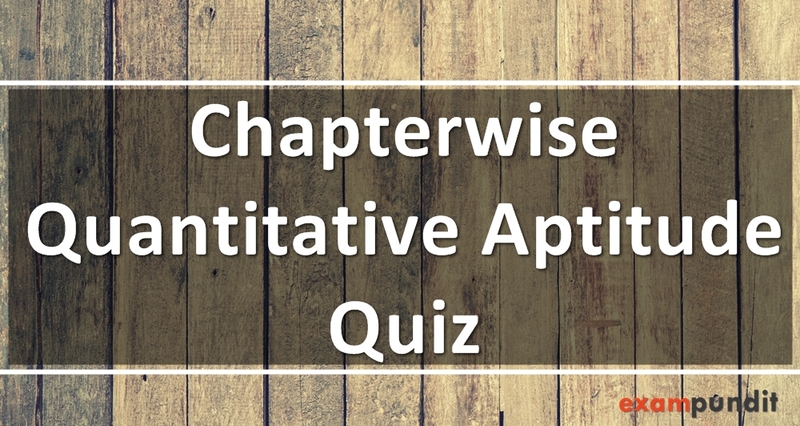 We will be providing chapterwise Quantitative Aptitude Quiz for the upcoming SBI PO Prelims 2017.
the already discounted price. What is the amount of discount she gets? employees over their previous wage? discount 25%, Ramu could buy another wristband worth rs 940 for his sister. What is the amount he paid for his own wristband? the articles in his shop? statements can be dispensed with to answer the above question? E) cannot be answered even with the 3 statements. tv sets to get 50% total profit, if he already sold one of them at rs 4 lakh? price did he buy the coffeemaker? she had initially marked her goods up by 40%? profit of 10%. The C.P. of the article was. price of 25 brinjals, what is the % profit or loss made by the seller? Disc=25%=25= cost of sister’s wristband. 5. Total cost of 4 tv sets = 3+5=8 lakh. initially marked her goods up by 40%. Let us assume that her cost price of the goods to be rs 100.
price being rs100 + 40% of rs100 = rs100 + rs40 = rs140. price, which in this case would be rs 100.
offered by her = [40/140]*100 = 28.57%. 10. Let the cost price of 1 brinjal be Rs 1.
brinjals= 25 * 1 = Rs 25. % loss = [ -5/25 ] *100 = 20%.